Purchasing affordable accounting and bookkeeping, IT infrastructure services, database administration, or human resources services will save you time, money, and headaches. It's a win-win! Outsourcing is widely used in the business community because you get a high level of expertise but only have to pay for the hours you need. Virtually all of the 75% of nonprofits with budgets below $1 million would benefit from contracting out for these areas. But larger organizations can benefit as well. Typically, an organization does not need to hire a human resources generalist until they have a staff of 25-35 people. Even large organizations with a multi-million dollar budget will benefit from contracting with us for database administration and information technology infrastructure. Rates change depending on the scope of work, but on average the monthly cost for contracting with 501 Commons' Financial Services is $300 a month. Organizations can work with an HR Partner for about $700 a month. Imagine the peace of mind you can gain from purchasing the maintenance of your IT infrastructure (including help desk support) for only $600 a month or database administration for just $150. 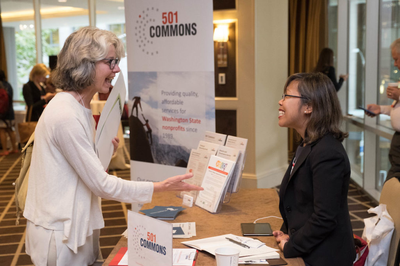 While there are companies providing these services that serve nonprofits as well as for-profit organizations, working with 501 Commons has two advantages: 1) We know and understand nonprofits since we are one and we work with 1,000+ each year. 2) When you work with 501 Commons, you are reinvesting in our sector and helping to secure the continued availability of the 30+ services we offer. Need services that we don’t offer? Access our Nonprofit Resource Directory and use our easy-to-use search tool for local companies/consultants who do.